RP Archives for My various RPs, Segments, etc. Sonic: (Whistles) Man that was fun. Too bad we lost though. Tails: Who are you talking to? Sonic: Tails, long time no see. Tails: Yeah, but you you're avoiding my first question. Sonic: Oh, well, no one really. Tails: (in a shrugging it off way.) ok.
Sonic: So what are you doing here anyways? Last I heard, you were back on Mobius. Tails: Well, I heard that you and Shadow joined a wrestling federation, so I had to come see. Sonic: How'd you hear about it? Tails: Oh I invented a device that let's us access Earth's internet and TV programs from Mobius. Sonic: That's cool. So you headed back? Tails: I figured I'd stick around, if that's ok with you. Sonic: What's up Tails? I see you made it there all ready. Tails: Yeah, but that's not why I called. Sonic: This about No Love Lost? Tails: Right. I checked the card like you asked but you don't have a match booked. Sonic: Awe Well, there's always the next pay-per-view. Tails: Not necessarily. There is an open invite match you could take apart in. Sonic: All right count me in. Tails: Don't you want to know what's it's about first? Sonic: Go ahead and tell me. Tails: Well, it's the Money in the Bank Qualifiers. Sonic: Money in the Bank? What's that? Tails: I did a little research and apparently if you when that title, you can cash it in at any time to get a match against the eWe Champion. Sonic: Now that's way past cool. Sign me up. Tails: I figured you would want to so I went ahead and signed you up as well as get you an interview. Sonic: All right, thanks Tails. Trixy: Hello this is Trixy from eWe. Here with me is none other than Sonic the Hedgehog. Sonic: You seem to have gotten over you're shock. Trixy: ...Uh, not completely. I just decided to ignore the fact that you're a... Walking... Talking...(gulp) Hedgehog. Sonic: It'll get easier the more you see me. Trust me. Trixy: Let's continue the interview. Now Sonic I've been informed that you're going to enter the Money in the Bank Qualifier. What made you decide to enter? Sonic: To get a shot at the eWe Champion that's why. Trixy: Even though it's possible that we'll have a new champion by the time the Money in the Bank match is finished, do you really think you have what it takes? Sonic: Sure do. I'm mean I've tangled with Robots, Aliens, and a fat bald guy who's suppose to be a genius. They way I figure I've fought with some really tough customers and I've pulled out on top. Trixy: Well, this match is different. For starters, you don't know who's going to be in it. Sonic: Tails told me some Pirate guy is entering. Sonic: Yeah that's him. Honestly, I'm not as impressed with him. All he wants to stick to the sidelines and just watch. You can't win with that attitude. Trixy: He does show a little bit of eagerness to win the match. Sonic: Really? Didn't he say he didn't want to be in it? He even said he doesn't want to be in the eWe. He is resourceful so I can't keep my guard down. Hopefully, I'll get to see that part of him otherwise if we face it's going to get over soon. Trixy: Well, Jack Sparrow won't be you're only opponent. Sonic: I'll just prepare for anything. Running at top speed gives you split second reflexes. So I can change strategies will quick. Trixy: What about you're loss? You didn't seem to show that. Sonic: Not to say anything bad about Shadow, but it was him who was pinned. He was having an off day. He even told me after the show that he didn't know of the match till it was close to start. Trixy: Anyone else you want to talk about, that may be in the match? Sonic: I would know. I'm knew here so I don't know much about the other wrestlers. But I'm learning. I just have to go in there expecting anything. Trixy: Well that's all we have time for. This has been Trixy with eWe Superstar Sonic the Hedgehog. (The Scene opens to Sonic walking down the hall of eWe. He's whistling a catchy tune. Suddenly, Some one walks up to him. Sonic: Amy? What are you doing here? Amy: Tails told me that you haven't lost your love for me. So I thought I'd come surprise you. Amy: It's ok, my love for you hasn't been lost either. Sonic: Are you even listening to what I'm saying? 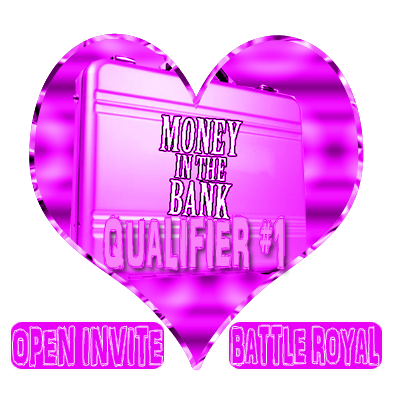 in the Bank and I can cash it in for a match against the eWe Champion. Amy: Oh. But don't worry, I can wait for you to start proving you love for me. Kelly: What's this about proving your Love Sonic? Amy: I was telling my boyfriend here, that he should start winning his matches to prove his love for me. Kelly: And why don't you do it Sonic? it's very Romantic. Sonic: Because she's not my girlfriend. Amy: Oh Sonic, don't kid around like that. Amy: Well, it's only a matter of time. So I guess I'll see you later. Kelly: Say Sonic since you're here mind having a interview. Kelly: Ok, so you're entering the Money in the Bank Qualifier am I correct? Sonic: Yep, Since I lost my chance to get into No Love Lost with my Tag-Team match, this gives me my chance. Kelly: So are you entering just so you can be in No Love Lost? Sonic: Of course not. This gives me a shot at the eWe Champion. A chance I'm not going to let slip by. Kelly: I see. So What do you think of the current participants in the match? Sonic: Well, like I said with the Pirate, I'm not to worried. Kelly: What about Chris Warren? winning. If they think that because I'm new here I'm not going to put up much of a fight, they have another thing coming. leave you in my dust. Sonic: Thanks but at No Love Lost It's going to be more than a speech. Kelly: I see. Well thanks for the interview. I'm going to go now.